As the title says, oats and lemon water....I was wondering if it would be good...it is fabulous! I ran out of homemade almond milk and I'm waiting for more almonds to soak. Since I only had filtered water with no flavor, I decided to cook my oats in lemon water...I wasn't sure at first but the lemon taste gave the oats a pop. If you don't have coconut water or milk to give your oats some flavor and a creamy texture, add a few squeezes of fresh lemon juice. I forgot the cinnamon and thought of it after I was eating these oats but I'll add the cinnamon to this recipe so you don't miss out! To a small pot, add the oats and turn on the heat to low. Add the 1 cup of lemon water or squeeze fresh lemon juice on top of the oats after you add the cup of water. Keep the heat on low and your oats will begin to cook. Add in some cinnamon and stir. The oats are done when almost all the water is absorbed. Stir the oats a few times and while there is still a little water in the pot, stir in the protein powder. Remove the pot from the heat and keep stirring. Transfer the oatmeal to a bowl and squeeze more lemon water on the oatmeal and stir. Mash or cut up a banana into small pieces and stir into the oats. Add peanut butter and goji berries and enjoy. 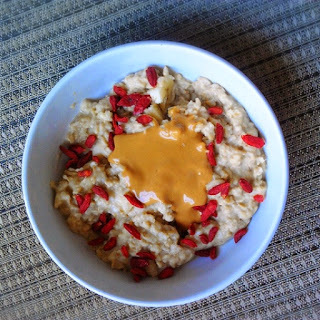 The goji berries will soften a little bit from the heat of the oats and will become chewy. Another variation is to food process the banana, cinnamon and peanut butter and stir into the oatmeal. Instead of the goji berries you can add fresh berries too. You can also add chocolate protein powder. Or ditch the protein powder and stir in some cacao powder or vanilla extract.